Hello! My name is Raven Tukes and I am currently a Fulbright English Teaching Assistant in Kinmen, Taiwan. Starting Fall 2016, I will be a graduate student at the Harvard Graduate School of Education pursuing my Masters in International Education Policy. On January 30, 2016, I had the pleasure of attending a social justice workshop with my co-teacher. While I was initially upset that this workshop would take place on a Saturday for 8 hours, in the end, I was delighted to have attended such a substantive professional development opportunity. The purpose of the workshop was to train Taiwan’s English teachers on how to integrate lessons on gender equality within the standard English language curriculum. From this workshop, I learned that teaching gender equality to elementary English language learners does not have to be complicated. In the workshop, we learned how to use a unit about names of clothing as an opportunity to teach students that clothing is not gender specific. To bring together both English language learning and gender equality, we taught our 5th graders the sentence pattern, “Girls can wear …” and “Boys can wear …”. We used simple clothing vocabulary to build language acquisition and also discussed that each person has the right to choose what they want to wear. If you are teaching a unit on occupations for example, you can also ask students to talk about the different career paths men and women take. For example, you can use pictures of both male and female firefighters, business people, chefs, police officers, to show these careers are not gender specific. As a school-wide initiative, my students all drew pictures of both men and women in various career roles, many of which are posted around the school to serve as a constant reminder to students. Lessons about gender equality, specifically for elementary school students, do not have to be super complicated and abstract; for EFL learners, the simpler the better. You can teach students simple phrases like “Boys and girls are equal” or have them read stories that defy typical gender norms. 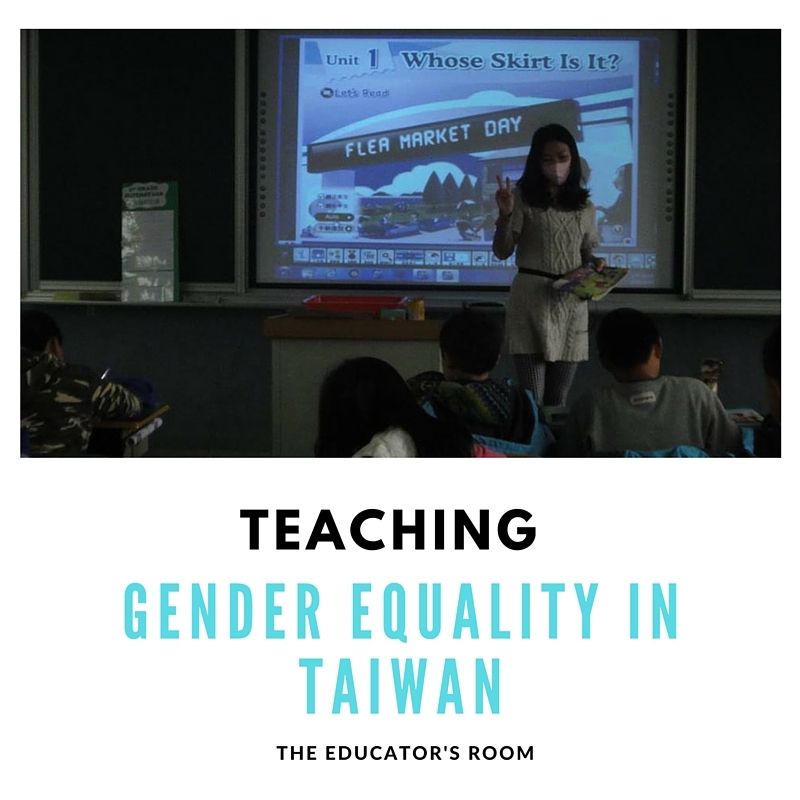 I am very proud to be teaching in Taiwan where gender equality education is mandatory. School is and will remain the largest socializing institution in the world, and I truly believe that if we start teaching students at a young age to not discriminate against others because of gender, we will build more socially conscious leaders in the long run! Note: Taiwan elected its first female president this year!